22nd California Hot Rod Reunion, Auto Club Famoso Raceway, October 18-20, 2013–In a stunning and near catastrophic climax to Top Fuel Eliminator, Adam Sorokin and his Champion Speed Shop dragster squeezed by a crossed-up Denver Schutz and his RE3 entry in the final round of eliminations. The top-end scoreboards displayed a ¼-mile clocking of 5.91 seconds at 216 mph for Sorokin with no time showing for Schutz, but that data was somewhat misleading as Schutz had crossed over into his opponent’s lane, ahead of Sorokin who had a blower explode at 800 feet. Schutz tripped the timing lights but already been disqualified for the centerline violation, handing the win to Sorokin. Leading up to the final, Sorokin and Schutz shared Low Elapsed Time laurels, as both competitors had laid down 5.671 clockings in eliminations. Top Speed numbers were posted by Jim Murphy, who posted a furious 261 mph en route to claiming the 2013 NHRA Heritage Series Points Title. 1st round Top Fuel results from Bakersfield: 11 of 13 qualified cars make the call for the 16-car eliminator. #1 qualifier Denver Schutz goes 5.68, 244 on a solo pass. #2 qualifier Rick McGee solos to a 6.20, early shut off. Bill Dunlap squeaks by Terry Cox, 5.81 with a blower pop to Cox’s 5.88, 237. Points in leader Jim Murphy barely drives around Ron August, 5.80 at a whopping 261-mph to August’s 5.94, 242. Brett Harris goes 5.75, 245 to defeat Sean Bellemeur’s 6.04. Rick White turns a 5.74 at 237, running by himself when Gary Read shuts off after staging. Adam Sorokin posts a 5.90 unopposed when Jim Young misses the call. Young was second in points and needed to go rounds to win the Points Title. 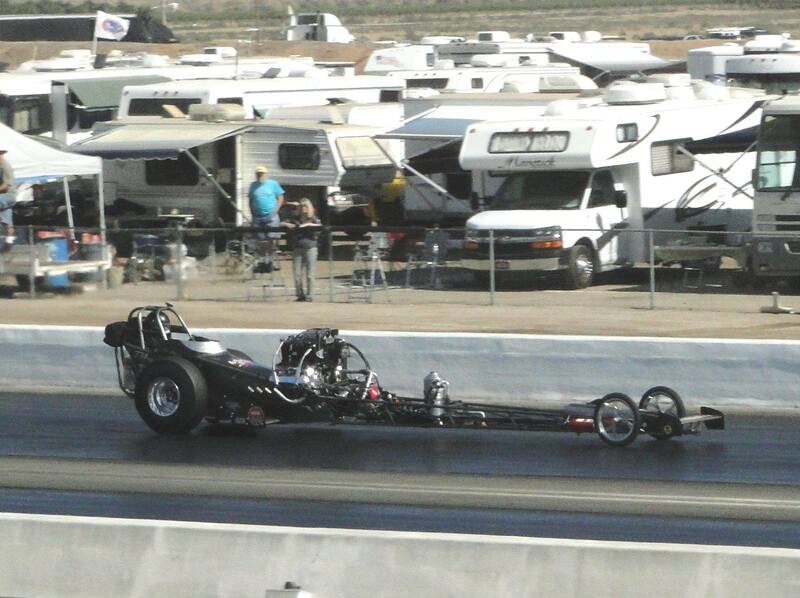 With his absence, Jim Murphy is your 2013 Heritage Series AA/Fuel Dragster Champion. 2nd round of Top Fuel results: Denver Schutz lays down a 5.67 at a stellar 255-mph to upend Bill Dunlap’s second-best 6.42. Trucks roll in Denver’s lane. Brett Harris turns 6.01 to defeat new Heritage Series champ Jim Murphy’s losing 6.25. Adam Sorokin drops a 5.67 at 247 mph to defeat Rick White’s 6.05, 188. Trucks roll again. McGee clicks it at half-track on his bye run into the semi-finals. Top Fuel semis: Adam Sorokin posts a stout 5.77 @ 226 mph to put Rick McGee on the trailer, who loses with a 7.10. Denver Schutz lays down a blistering 5.69 at 246 to drive around Brett Harris, who goes 5.76 at 246. In the Top Fuel final at Famoso, Adam Sorokin put a wheel out on Denver Schutz at the hit, then they go back and forth until 660′ when Schutz begins to catch and pass Sorokin who lifts the blower. Schutz then pulls right across the center line. Sorokin is credited with a 5.91 at 216 to claim Top Fuel Eliminator at the 22nd California Hot Rod Reunion. Schutz is not credited with a time, but it was his car that triggered Sorokin’s light, as Schutz was in Sorokin’s lane and crossed the finish line first–just in the wrong lane. Low ET: Denver Schutz, 5.671. Adam Sorokin, 5.671. Final qualifying: 1. Denver Schutz, 5.67. 2. Rick McGee, 5.73. 3. Rick White, 5.76. 4. Jim Murphy, 5.79. 5. Brett Harris, 5.83. 6. Adam Sorokin, 5.86. 7. Terry Cox, 5.96. 8. Bill Dunlap, 6.03. 9. Jim Young, 6.16. 10. Sean Bellemeur, 6.20. 11. Ron August, Jr. 6.73. 12. Gary Read, 8.36 13. Jim Boyd, 32.00. DQ: Brendan Murry.